fresh inc is a one-of-a-kind chamber music festival that redefines the training process for emerging musicians. Since 2012, we have helped performers and composers to envision and launch their own authentic careers in music, rooted in adventurous genre-defying collaboration, entrepreneurial thinking, and meaningful partnerships with audiences and community. fresh inc is led by Fifth House Ensemble, whose insatiable curiosity and collaborative spirit have guided 11 years of transformative cross-media and cross-genre performance experiences, heartfelt community-based work, arts-integrated educational programs, and emerging artist training. Our internationally recognized composition faculty includes Dan Visconti and Stacy Garrop, whose careers and landmark projects are defined by adventurous partnerships with artists, audiences, and communities alike. 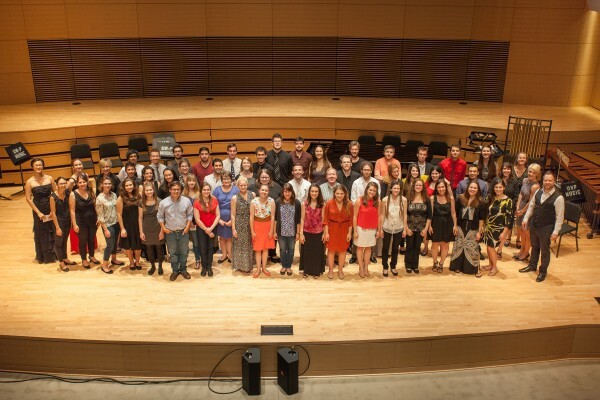 Our alumni form lasting connections with each other, continuing to do great work together and with us for years after their participation in fresh inc. Fifth House Ensemble has been proud to work with many of our past participants professionally as arrangers, composers, performers, and collaborators. To see what our alums are working on, head to our fresh ventures page. fresh inc is supported in part by The Steven R. Gerber Trust, The Racine Community Foundation, The Kenosha Community Foundation, The Amphion Foundation, and The Aaron Copland Fund for Music, Inc.